The Duo is a paradigm of musical collaboration in their seamless, unified performances. 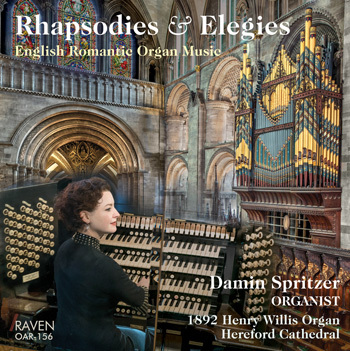 These rarely heard works will provide pleasurable listening, and attractive ideas for those seeking new "organ plus" repertoire. The performances by Czech flutist Zofie Vokalkova and American organist Kathleen Scheide are impeccable, and the sound is luscious. I found value in these selections that I believe flutists and organists would appreciate. Recent compositions for the combination of flute and organ are played by Due Solisti: Žofie Vokálková, flute; Kathleen Scheide, organ. The works are recorded using two fine pipe organs: one built in 2000 by the *Mander firm of London, England, at the Presbyterian Church of Chestnut Hill in Philadelphia; and the other built in 2007 by the †Dobson firm of Lake City, Iowa, at St. David’s Episcopal Church, Radnor (Wayne), Pennsylvania. Due Solisti tours in the United States under the management of Phillip Truckenbrod Concert Artists. The ensemble has performed extensively in the Czech Republic, Germany, and Russia. In a typical year, Žofie Vokálková plays in more than 150 solo and chamber music concerts. A Prague native, Žofie is a graduate of Prague Conservatory. She studied with Frantisek Malotin, Christian Lardé, Meinhardt Niedermayer, and James Galway. She has won prizes at several international performance competitions; has been an orchestral soloist in Europe, Asia, and the United States; and has been featured in numerous radio broadcasts and recordings. She currently is flute soloist for the orchestras Virtuosi di Praga and Prague Symphony Orchestra. Previously, she had been first orchestral flute, Prague Symphony Orchestra, and flute professor at Prague Conservatory. Kathleen Scheide teaches harpsichord at Westminster Choir College, Princeton, New Jersey. She lives in a seventeenth-century stone house, Wiggan, and plays organ in the 1740 stone barn at Church of the Loving Shepherd, Bournelyf, West Chester, Pennsylvania. Dr. Scheide earned degrees from the New England Conservatory (with honors) and the University of Southern California (organ prize), where her teachers included John Gibbons and Cherry Rhodes. Kathleen has concertized as an organ and harpsichord soloist throughout the United States, Canada, Mexico, Europe, the Far East and the Caribbean. As a published composer, she has a large imprint discography. 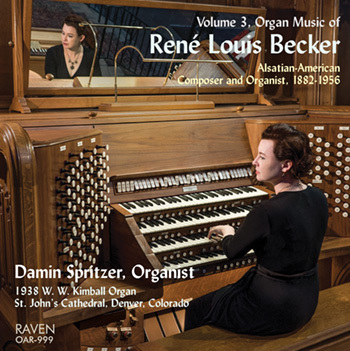 She plays three of her compositions and three works by Franz Liszt on Raven OAR-350. Czech composer Jirí Ropek (1922-2005) studied organ at the Prague Conservatory of Music, Charles University, and the Academy of Music. He was organist at the Basilica of St. James in Prague for many decades in addition to his position as Professor of Organ at Prague Conservatory. Although at St. James he presided over the largest organ in the Czech Republic, Ropek’s music and its neo-classic style seem also informed by the many more moderate Baroque organs of his region. As a composer, Ropek is widely known for his choral and organ music and Sonatas for various solo instruments: trumpet, oboe, violin and organ, as well as the Flute Sonata presented here. Pamela Decker (b. 1955) is Professor of Organ/Music Theory at the University of Arizona in Tucson, where she has received awards for both Research/Creative Activity and for Teaching Excellence. She also serves as organist at Grace St. Paul’s Episcopal Church in Tucson. She is active as a performing and recording artist as well as professor, church musician and composer. Her primary publishers are Wayne Leupold Editions and C.F. Peters. Chaconne on Ave caeli janua was commissioned by Due Solisti. The chant Ave caeli janua (“Hail, Mary, Gate of Heaven”) is found in the Moissac manuscript, where it is immediately followed by a different hymn to Saints Peter and Paul. In the American Episcopal hymnal, the tune Ave caeli janua is associated with a text praising Peter and Paul (“Two stalwart trees”). Lynn Job (pronounced with a long “o”) was born in South Dakota (1959), and owns Buckthorn Music Press (ASCAP/MPA). She holds a Doctor of Musical Arts degree and is an active professional composer (all serious genres, sonic e-art, and broadcast). She is also a published poet/author, actress, professor, archaeology hobbyist and more. Her main production studio is in North Texas. The six days before Jesus’s last Passover Festival and subsequent Passion, His friend Mary unseals a new alabaster vessel and pours sixteen ounces of precious spikenard fragrance oil (a Himalayan herb – Nardostachys jatamansi) on His feet at the special evening supper gathering held in His honor in her home (the home shared with her sister Martha and her brother Lazarus) in Bethany, Judea. Bethany – now called Lazariyeh – was Jesus’s last rest stop before arriving in Jerusalem. He accepts the gift (worth a year’s wages) as a prophetic funerary gesture, and the scent fills the house. Prague composer, pianist and conductor Michal Macourek (b. 1972) is Professor of Composition and Conducting at Jaroslav Jezek Conservatory, cofounder and Artistic Director of the contemporary music ensemble Resonance, and conductor and Artistic Director of the contemporary music chamber orchestra Archioni Plus. He also tours intensively with his wife Catherine in the flute and piano duo Da Capo, playing music of all eras. His compositions have been performed at several major festivals: Prague Spring Festival, ISCM, Czech cultural days in France; and in many European and overseas countries including France, Germany, Greece, Lebanon, Romania and the US. Duo per flauto e organo was written for Due Solisti. Rather than the fourths of Hindemith-style tonality as explored in the Sonatas by Ropek and Rogg, this meditative piece exploits the sonority of the fifth. Throughout the ternary form the composer plays with the colors of the subtle flute and the massive organ. Yen Barabas (1901-1939) was a Polish Jew who lived and died in Prague during World War II. He left behind his “Jody” Suite as a manuscript later discovered inside Žofie Vokálková’s house. After finishing his studies at Geneva Conservatory, Lionel Rogg (b. 1936) launched his career by performing the complete organ works of Bach at Victoria Hall, Geneva, where he is now Resident Organist. Since that time, Rogg has given countless organ recitals in Europe, the Americas, Australia, and the Far East. Professor of Organ at the Geneva Conservatory until 2001, and now Professor of Organ and Improvisation at the Royal Academy of Music in London, Lionel Rogg has welcomed students from all over the world. His catalogue as a composer contains works for organ, piano, choir, orchestra and chamber ensemble. In 1989, Lionel Rogg received an Honorary Doctorate from the University of Geneva. St David’s Episcopal Church, Radnor, Penn.